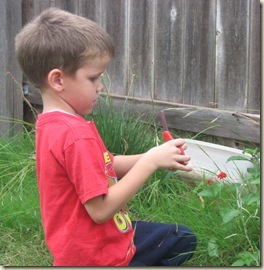 This entry was posted in botany, preschool by Amanda. Bookmark the permalink. Thank fully Selena is still content with just picking the ones in the yard, we have to be careful about the ones along the street since so many people plant flowers right along the sidewalks here. I will remember this tip! Pretty flowers! We have some problems trying to clarify which flowers are “pickable”. I love the hair picture! I love the flower in your hair too. 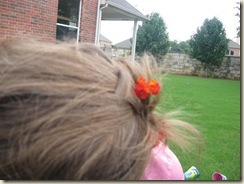 I am always worried that the flower I put in my hair will have bugs in it and they will end up crawling all over my scalp. See the crazy things I worry about? 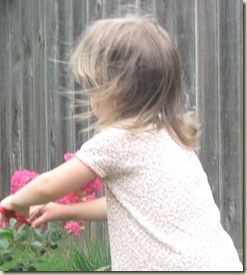 Caroline (my two year old) loves to pick flowers as well. Except she more yanks them up by the roots. This is a good tip, but I don't know about giving a two year old scissors. But Caleb (my almost 5 year old) would do just fine with this. Sure would save our garden.